The Foxrox Wah Retrofit is easy to install, however, don't attempt it unless you have decent soldering skills. The examples above are meant to serve as instructions, and as a way for you to decide if it's something you can pull off. Click the links to view step-by-step illustrations. This modification involves removing one wire from the pedal and soldering four wires into the pedal. Soldering skills are required, and a basic knowledge of electronics doesn't hurt. But before you even attempt it, you should check out all the installation pages to make sure it's something you can handle. If you'd rather not do it, either find a qualified technician or send your pedal to Foxrox. 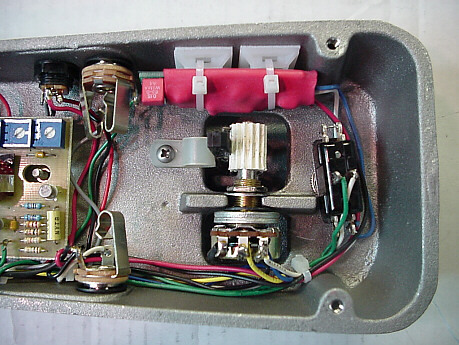 Foxrox Electronics, LLC is not responsible for any damage caused by installing the FWR in any Wah Wah pedal. If you order the FWR, put it in your pedal and mess things up, you cannot hold Foxrox Electronics, LLC responsible. Foxrox will take the FWR back and refund your money, even if you mess it up. We'll even offer to fix your pedal. But you might want to inquire about the warranty on your Wah pedal before doing ANY modifications. There's a pretty good chance that you will void the pedal's warranty. Any qualified technician can remove the FWR without leaving a trace of it.